QoS-aware service composition and binding are among the most challenging and promising issues for service-oriented architectures. The aim of QoS-aware service composition is to determine the set of services that, once composed, will perform the required functionality, and will best contribute to achieve the level of QoS promised in Service Level Agreements (SLAs). While the existing works focus on cross-domain QoS attributes, it would be relevant to support service composition and binding according to some characteristics on the borderline between functional and non-functional attributes, often proper of the service domain. This paper presents an approach to deal with domain-specific, customized QoS attributes. The paper presents a tool that supports the definition of the attribute types and the way attributes aggregate over a composi- tion. Finally, the paper describes a QoS evaluator that, integrated with our previously developed binder, allows the use of domain specific QoS attributes for composite service binding and replanning. The application of the approach is shown through a case study related to the image processing domain. 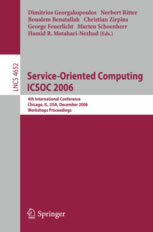 This book constitutes the workshops of the 4th International Conference on Service-Oriented Computing, ICSOC 2006, held in Chicago, IL, USA in December 2006. The two workshops presented were carefully reviewed and selected from six submissions. Both ICSOC'06 workshops were held as one-day-workshops the day before the major conference program of ICSOC'06 started. This volume contains separate descriptions of both workshops as well as all high-quality paper contributions to these two workshops.